There are two peroneal tendons in the ankle that run side by side, behind the outer ankle bone (lateral malleolus). These are the peroneus brevis and peroneus longus tendons, and they are attached to muscles of the same name on the outside of the calf. They are kept together by a sheath, which is in turn stabilized by a band of tissue called the superior peroneal retinaculum. What is the function of the peroneal tendons? 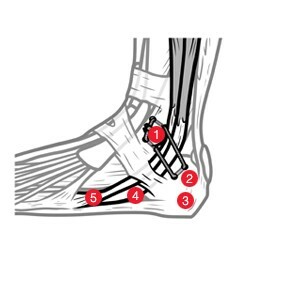 The peroneal tendons stabilize the ankle joint, support the arch of the foot, and help to prevent sprains. As they run behind the ankle bone, they act as a sort of pulley system that aids flexion of the ankle joint, enabling you to point your foot downwards (plantar flexion). What are the main causes of peroneal tendon dislocation? 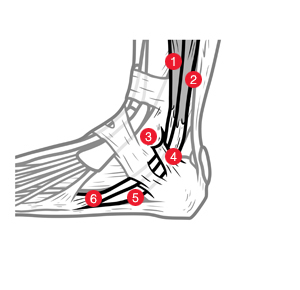 Dislocation of the peroneal tendons may be caused by a sudden impact or jarring of the ankle, or an ankle sprain. People with high foot arches are more at risk of peroneal tendon dislocation than those with more shallow arches. Peroneal tendon dislocation can sometimes cause the sheath that keeps the tendons together to split, or the superior peroneal retinaculum to become damaged or stretched. This will make future dislocations more likely. The ankle may also be immobilized in a brace or plaster cast for 3-4 weeks. Anti-inflammatory medications may be administered to reduce pain and swelling. If conservative treatment is unsuccessful, or the peroneal tendons continue to dislocate, surgical treatment may be necessary. Frequent dislocation of the peroneal tendons is called peroneal tendon subluxation. For information about some typical surgical procedures used to treat peroneal tendon subluxation, please click the buttons above. In this procedure the band of tissue which holds the peroneal tendons in place (the peroneal retinaculum) is repaired using sutures (stitches). Success depends on the quality of the retinaculum tissue and whether there is enough to cover the tendon. This procedure involves making cuts in the lower end of the fibula (the bone which runs alongside the shin bone) so that the peroneal tendons have a deeper groove behind the outer ankle bone (lateral malleolus) in which to sit and glide. Fibular groove deepening and retinacular reattachment are often performed together. In a distal fibular osteotomy procedure (also known as a bone block procedure), a section of bone is cut away from the lower end of the fibula, near the outer ankle bone. The section of bone is then slid backwards to create a kind of ledge for the peroneal tendons to sit behind. It is fastened in place with a screw. The bone block procedure may cause irritation of the peroneal tendons as they come into contact with the bone block, which can be rough. The rehabilitation process is often lengthy due to prolonged immobilization of the ankle in a plaster cast after the operation. The Neoligaments 10 mm x 500 mm Poly-Tape implant is indicated for stabilization of the peroneal tendons around the outer ankle bone (lateral malleolus). The Poly-Tape is a textile implant made from polyethylene terephthalate (polyester), which has been in use for the reconstruction of ligaments and tendons for more than 25 years. Its open weave structure acts as a scaffold and encourages tissue ingrowth, where tissue grows into and around the gaps in the device, adding additional strength to the repair. The open weave structure of the Poly-Tape acts as a scaffold and allows new tissue to grow through and strengthen the repair (tissue ingrowth). The surgical technique is simple and requires no special equipment. The Poly-Tape allows for early rehabilitation and return to normal activities, including sport, in around three months. A specialized postoperative rehabilitation regime has been developed in conjunction with a leading physiotherapist. A small incision is made directly over the peroneal tendons, just behind the outer ankle bone (lateral malleolus). Two parallel drill holes are made in the ankle bone, and one drill hole is made in the heel bone (calcaneous). The sheath that surrounds the tendons is repaired using sutures (stitches). The Neoligaments Poly-Tape implant is passed over the top of the repaired tendon sheath and through the bone tunnels, to hold the tendons in place. The Poly-Tape is then secured with a reef knot. Below is a brief outline of the prescribed programme following surgery with the Neoligaments Poly-Tape. If you would like to see the full rehabilitation programme, please click the link below. For the first two weeks following surgery, the ankle will be placed in a plaster cast. Ambulating with the plaster cast, weight bearing as tolerated. Gluteal, quadriceps, hamstring and core exercises are commenced. The plaster cast is removed at two weeks, and a removable splint is applied for a further four weeks. With the splint removed, range of motion exercises are begun (e.g. movement of the foot and ankle as tolerable). Do not stretch into inversion (turning the foot on its side so that the sole points inwards). With the splint on, plantar flexion and dorsiflexion exercises are commenced. Treadmill walking with speed progression. Use of removable splint is discontinued. All range of motion exercises are continued. The patient performs functional activities on various surfaces, e.g. trampette, foam roller. Increase difficulty by increasing speed. The technique for repairing dislocated peroneal tendons using Neoligaments’ 10 mm x 500 mm Poly-Tape was developed in conjunction with Mr. G. Sefton of Harrogate District Hospital, and Mr. A. Jennings of University Hospital of North Durham.